A nuclear heart scan is a type of medical test that allows your doctor to get important information about the health of your heart. During a nuclear heart scan, a safe, radioactive material called a tracer is injected through a vein into your bloodstream. The tracer then travels to your heart. The tracer releases energy, which special cameras outside of your body detect. The cameras use the energy to create pictures of different parts of your heart. To provide information about the flow of blood throughout the heart muscle. If the scan shows that one part of the heart muscle isn't receiving blood, it's a sign of a possible narrowing or blockage in the coronary arteries (the arteries that supply blood and oxygen to your heart). Decreased blood flow through the coronary arteries may mean you have coronary artery disease (CAD). CAD can lead to angina, heart attack, and other heart problems. When a nuclear heart scan is performed for this purpose, it's called myocardial perfusion scanning. To look for damaged heart muscle. Damage may be due to a previous heart attack, injury, infection, or medicine. When a nuclear heart scan is performed for this purpose, it's called myocardial viability testing. To see how well your heart pumps blood out to your body. When a nuclear heart scan is performed for this purpose, it's called ventricular function scanning. Usually, two sets of pictures are taken during a nuclear heart scan. The first set is taken when the heart is beating fast due to you exercising. This is called a cardiac stress test. If you can't exercise, your heart rate can be increased using medicines such as adenosine, dipyridamole, or dobutamine. The second set of pictures is taken later, when the heart is at rest and beating at a normal rate. SPECT is the most well-established and widely used type, while PET is newer. There are specific reasons for using each, which are discussed in the following paragraphs. Cardiac SPECT is the most commonly used nuclear scanning test for diagnosing coronary artery disease (CAD). Combining SPECT with a cardiac stress test can show problems with blood flow to the heart that can be detected only when the heart is working hard and beating fast. SPECT also is used to look for areas of damaged or dead heart muscle tissue, which may be due to a previous heart attack or other cause of injury. SPECT also can show how well the heart's left ventricle pumps blood to the body. Weak pumping ability may be the result of heart attack, heart failure, and other causes. The most commonly used tracers in SPECT are called thallium-201, technetium-99m sestamibi (Cardiolite®), and technetium-99m tetrofosmin (Myoview™). PET uses different kinds of tracers than SPECT. PET can provide more detailed pictures of the heart. However, PET is newer and has some technical limits that make it less available than SPECT. Research into advances in both SPECT and PET is ongoing. Right now, there is no clear cut advantage of using one over the other in all situations. PET can be used for the same purposes as SPECT – to diagnose CAD, check for damaged or dead heart muscle, and evaluate the heart's pumping strength. PET takes a clearer picture through thick layers of tissue (such as abdominal or breast tissue). PET also is better than SPECT at showing whether CAD is affecting more than one of your heart's blood vessels. 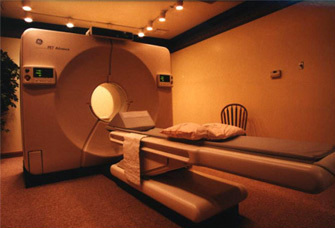 A PET scan also may be used if a SPECT scan wasn't able to produce good enough pictures. Talk to your doctor about how the nuclear heart scan is done. Discussing your overall health, including health problems such as asthma, chronic obstructive pulmonary disease (COPD), diabetes, and kidney disease, is important. If you have lung disease or diabetes, your doctor will give you special instructions before the nuclear heart scan. Also, let your doctor know about any medicines you take, including prescription and over-the-counter medicines, vitamins, minerals, and other supplements. Some medicines and supplements can cause problems when used with adenosine, dipyridamole, or dobutamine (medicines used to increase your heart rate during a stress test). If you are having a stress test as part of your nuclear heart scan, wear comfortable walking shoes and loose-fitting clothes for the test. You may be asked to wear a hospital gown during the test. A nuclear heart scan can take a lot of time. Most take between 2 to 5 hours, especially if two sets of pictures are needed. Before the test begins, the doctor or a technician will use a needle to insert an intravenous (IV) line into a vein in your arm. Through this IV line, he or she will put the radioactive tracers into your bloodstream at the right time. You also will have EKG (electrocardiogram) patches attached to your body to check your heart rate during the test. If you're having an exercise stress test as part of your nuclear scan, you will walk on a treadmill or pedal a stationary bicycle, while attached to EKG and blood pressure monitors. You will be asked to exercise until you're too tired to continue, short of breath, or having chest or leg pain. You can expect that your heart will beat faster, you will breathe faster, your blood pressure will increase, and you will sweat. Report any chest, arm, or jaw pain or discomfort; dizziness; light-headedness; or any other unusual symptoms. If you're unable to exercise, your doctor can give you medicine to make your heart beat faster. This is called a chemical stress test. The medicine used may make you feel anxious, sick, dizzy, or shaky for a short time. If the side effects are severe, other medicine can be given for relief. Before the exercise or the chemical stress test stops, the tracer is injected through the IV line. The nuclear heart scan will start shortly after the exercise or chemical stress test. You will be asked to lie very still on a padded table. The nuclear heart scan camera, called a gamma camera, is enclosed in a metal housing. The part of the camera that detects the radioactivity from the tracer can be put in several positions around your body as you lie on the padded table. For some nuclear heart scans, the metal housing is shaped like a doughnut and you lie on a table that goes slowly through the doughnut hole. The computer used to collect the pictures of your heart is nearby or in another room. Two sets of pictures will be taken. One will be taken right after your exercise or chemical stress test and the other will be taken after a period of rest. The pictures may be taken all in 1 day or over 2 days. Each set of pictures takes about 15 to 30 minutes to do. Some people find it hard to stay in one position for some time. Others may feel anxious while lying in the doughnut-shaped scanner. The table may feel hard. Sometimes, the room feels chilly because of the air conditioning needed to maintain the machines. Let the person performing the test know how you're feeling during the test so he or she can respond as needed. You may be asked to return to the nuclear medicine center the next day for more pictures. Outpatients will be allowed to go home after the scan or leave the nuclear medicine center between the two scans. Most people can go back to daily activities after a nuclear heart scan. The radioactivity will naturally leave the body in the urine or stool. It's helpful to drink plenty of fluids after the test. The cardiologist or radiologist will read and interpret the results of the test within 1 to 3 days. Results will be reported to your doctor, who will contact you to discuss the results. Or, the cardiologist may discuss the results directly with you. What does a nuclear heart scan show? What are the risks of a nuclear heart scan? The radioactive tracers used during a nuclear heart scan expose the body to a very small amount of radiation. No long-term effects have been reported from these doses. If you have coronary artery disease, you may have chest pain during exercise or when you take medicine to increase your heart rate. Medicine can be given to relieve this symptom. Some people may be allergic to the radioactive tracers, but this is very rare. Women who are pregnant should tell their doctor and technician before the scan is done. It may be postponed until after the pregnancy.